We’re excited to introduce our newest climber—the JigJag Climber! If the name doesn’t grab your attention, the design certainly will! Available as a PlayBooster® of freestanding play component, kids will jig and jag their way up the JigJag Climber and then slide down a fire pole at the end. Available in a single or double configuration, the JigJag Climber is a high-value addition for new or existing playgrounds. It accommodates multiple kids at once, and will deliver a unique aesthetic by visually and physically expanding the footprint of any PlayBooster playstructure. Learn more about the JigJag Climber and find sample designs here. 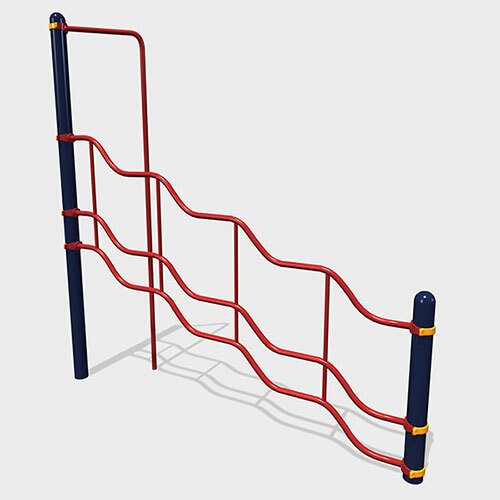 This entry was posted in New products, Play, Play Environment, Playground, playgrounds, Products, Traditional and tagged fire pole, Freestanding play, JigJag Climber, PlayBooster playstructure, Playground climber by PlayLSI. Bookmark the permalink.